Ja Makin’ Me Crazy Mango Jam is a juicy jam with packed with mangos and raspberries. The mango are tangy and tropical and the raspberries add a hint of sweetness. It’s the perfect combination of lovely fruit and they combined to make a serene color. The spices combined with mango add a tropical flavor. Think Caribbean sunset with delicious island flavors! Since I shared my recipe for the Jerk Chicken Bowl with California Fig Salsa (which included mangos) I wanted to continue sharing those same bright flavors and this jam came right to mind! Ja Makin’ Me Crazy Mango Jam has delicious island flavors and is as pretty as a sunset on the beach! But let me tell you how this jam really came to be…. I’ve made mango jam several times, however this time I realized I was short and needed more fruit. I wasn’t about to go to the store so I opened the fridge and realized I had some raspberries – perfect! And then thought I’d spice it up with some interesting flavors and that’s how this jam was born. The raspberries add just a bit of flavor, but really spike it with a pretty color. The Caribbean spices; nutmeg, cinnamon & ginger and infuse the jam with the best of tropical flavors! This low-sugar mango jam is sweet and delicious! If you haven’t eaten mango before, here’s some great information to help you learn more about this fruit! Is mango rich in pectin? Actually it’s not – many fruits with seeds are rich in pectin but mangos aren’t one of them. How can I tell when a mango is ripe? the color of the skin has nothing to do with ripeness, don’t rely on the color of the skin. How do I store mangos? store ripe mangos in the refrigerator for 4-5 days. What mangos to pick for mango jam? Pick mangos at their peak of ripeness. Overripe fruit will not produce the best jam, underripe mangos aren’t juicy or sweet. How do I stop a mango from ripening? If your mango is ripe but you’re not ready to make jam, store it in the refrigerator. Ripe mangos will keep in the refrigerator four to five days. You know I make a lot of jams and jellies during the summer! Because many of my family members are diabetic, I use a low sugar jam making method using the pink box of pectin from Sure-Jell. I’ve found the low sugar versions to be just as delicious, the key is using fresh fruit at it’s peak of flavor. I’ve experimented using sugar substitutes and it changes the taste and I have not found one I’d recommend. Ja Makin’ Me Crazy Mango Jam – juicy mango and sweet raspberries mixed with Caribbean spices make a delicious jam! This is one of my favorite jams and I think you will enjoy it as much as we do! The sweet juicy mangos and raspberries pair perfectly with the spices and enhance the tropical flavors in this low-sugar jam. Click here to subscribe and get a FREE Cheatsheet with recipes, meal-pairings and more! I think many folks shy away from making jam, but it’s really not hard at all, you just need a good 30-45 minutes in the kitchen and in the time it takes to seal the jars at the end, you’ll have your kitchen cleaned up and some delicious jam to enjoy and/or give as a gift! More mango madness? Here are some great recipes to try! More delicious Homemade Jam recipes to try! Homemade Strawberry Jam: A Margarita on Toast! Ja Makin' Me Crazy Mango Jam - perfectly ripe mangos Caribbean spices enhance the tropical flavors. This is really, really good! Clean & sterilize jars, lids and rings. Measure 3 cups sugar into a large bowl. Remove ¼ cup sugar and in a separate bowl, mix it with the powered Sure-Jell. Set aside both mixtures; the sugar and Sure-Jell/sugar. Peel the mangos, remove the seeds and chop into a small 1/2 dice. You will need 5 1/2 cups chopped mango. Clean raspberries, measure 1/2 cup - add both to a heavy bottom stock pan on the stove. Add in the spices, butter and Sure.Jell/sugar mixture and stir thoroughly. Place mixture over high heat and bring to a boil stirring constantly. When it comes to a hard rolling boil (one that you can't stir down) add the remaining sugar and return to a boil, again stirring constantly. Boil hard for exactly one minute and remove from heat. Ladle into clean, sterilized jars. Clean the tops of the jars carefully (so you get a good seal). Place lids on jars and screw on the rings. Place the jam in a hot water bath for 10 minutes - this will help seal the jars. Remove from heat and place them on a heatproof surface (I usually use a heavy cutting board. You'll hear the jars make a popping noise as they seal. You can check to see if the jars have sealed by pressing down in the center of each jar. If it is sealed, it will not move. If it didn't seal the "button" on the top will pop up & down. Summertime is the best time to make jam when fruit is fresh and in season! Making jam is easier than you think. I have several wonderful recipes on the blog and you can find a complete listing of them clicking here! 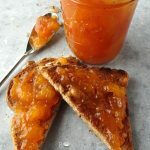 The most popular jam recipe on my blog? Christmas in July Pepper Jam! Pinned over TWENTY-FOUR THOUSAND times, it’s an easy jam to make and a great holiday gift! 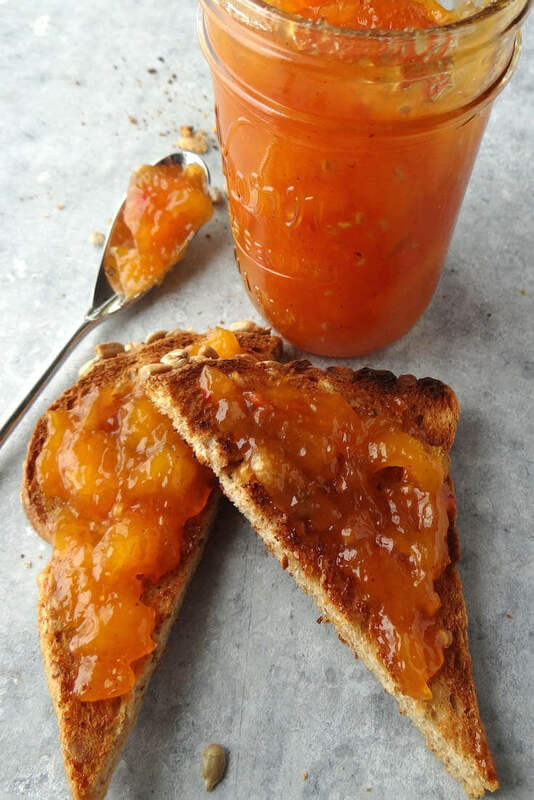 Looking for more Mango Jam Recipes? Clean the fruit by using 1 part vinegar to 3 parts water, add the fruit and swish around really well. Don’t change the amount of sugar the recipe calls for. The sugar not only sweetens the fruit but also preserves it. If you reduce the amount of sugar, you may end up with mold on top of the jam even though you’ve sealed it properly. Don’t change the amount of fruit – if you put in too little, it can get so thick, it’s like paste – too much fruit it may not set and will become syrup. Although the jars and rings are reusable, the lids are not – you’ll need to purchase new ones. Love the name so much that I’m gonna have to make this recipe! The photos look good enough to lick the screen- ha! I bet the raspberries kept it more interesting too! That looks lovely! Yes, good point Laura. The raspberries added a new interesting flavor! O wow, I bet this tastes awesome! Always a fan of mango! Thanks Rebecca – we just love this jam! I love mango and this jam looks amazing! Mango jam?! I bet this would be amazing on just about anything! Oh yes, we had it on ice-cream the other night, new love! 😀 Loved the pictures too, thanks Susan for stopping by!!! So pretty, and I’m sure very tasty! I’m not diabetic, but most all jams are way too sweet for me! Me too – that’s why I like the low sugar version. Thanks Mimi! Awesome, that’s a GREAT idea Sandra! My hubby always uses jam on ice-cream – love the yogurt tip!! WOW!! I love anything Caribbean. I would never thought of making a jam in that flavor. Great recipe, Debra. Thanks Rini – love this jam, I wish you were closer I get you a jar! Oh this is making me crazy too. Raspberries and mango! YES. Do you ship? For you my friend….YES! 😀 Love to have you try this jam! MMMMM Mango jam, I love it! Your photos are gorgeous, and making me very hungry! Thanks Lizzy, the pictures are definitely drool-worthy! Thanks so much for stopping by! I haven’t made a jam like this before….I love all of your flavor combinations. I hope you give it a try Sandi – I think you’ll really enjoy it! This jam sounds delicious, I love all the spices in it! 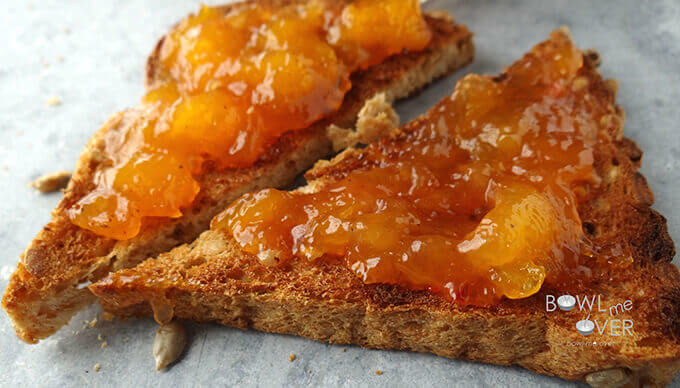 I’m a huge, huge fan of mangoes, and this jam looks just fabulous. And so easy as well. I might try it soon! My mouth is watering just reading this recipe, Deb! I love the name of your jam too – and it’s great it is lower sugar as well. Thank you for sharing this lovely recipe with us at Hearth and Soul. have you ever substituted blueberries for the raspberries?? or any other berry?? I made the mango raspberry and it is WONDERFUL, my new favorite and SO SO SO easy to make!!! but i have some blueberries that need using and wondered about changing it up??? suggestions?? Hey Kelli – so great to hear your feedback on the jam, I just LOVE this one too! How many blueberries do you have? 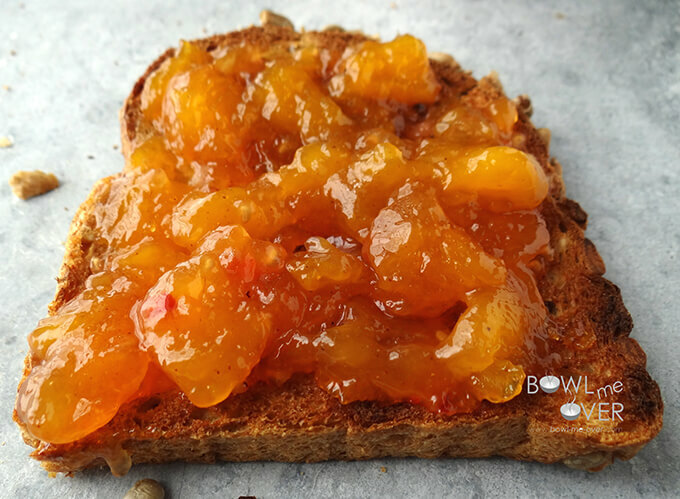 This is another GREAT jam I just love – https://bowl-me-over.com/blueberry-pizzaz-jam/ But if you don’t have that many blueberries, I would definitely give the blueberry/mango combo a try, I bet it will be just heavenly! Let me know please!! Just made a batch today for first time using this recipe. I kinda scorched the bottom and quickly transferred to a different pan. Fingers crossed the taste didnt stick. Looks delicious and i think it will be a hit. I reduced the sugar dramatically because my mangos were so sweet. I hope it doesn’t affect the consistency. I seen your comment on my Facebook page & wanted to know if you have tried ordering directly off Amazon? I need to check with one of my Canadian friends just to double check! Ja Makin’ Me Crazy Mango Jam is absolutely delicious! I will be making this again. Actually, I will try to get a dozen more jars canned up now that it is mango season. I cannot begin to describe how good this is. I will using the cardamom again. It added a delightful flavor and really complimented the other spices. Try this, you will like it. Thanks for such a great recipe. I would give this 10 stars if they allowed that many. I’m so happy you love this jam as much as we do! It’s SO GOOD! And you’re right, with mangos in season they are inexpensive right now too. Time to make some jam!!! Well, I just couldn’t help myself. I had to make another batch. For this batch I had about 3/4 cup of sweet cherry and strawberry mix left over from yesterday’s jammin, so that went into the Ja Makin’ Me Crazy Mango Jam. I figured mango and lime works well together so this batch got lime juice instead of lemon. The color is lovely and the taste is to die for. It is a little different flavor than the one with lemon but just as good. This batch also got the cardamom. I also whipped up a batch of your Chinese 5 spice. curry and red wine strawberry jam. Quite good and delightfully different. I could eat a whole jar at once, of either flavor. I recommend that everyone tries making a batch of Ja Makin’ Me Crazy Mango. It is just super good. That is awesome Sam, you are set now just think of all that jam you’ve put up! Do you use it all yourself or give it as gifts? And the strawberry, that’s so yummy too! I’ve caught Dan with a spoon and a jar before 😉 great minds think alike! Ham you tried the Bam Bam Pomegranate Jam yet? That one is spectacular too!! how soon can you eat this jam after making it ? Great question Christine – it’s ready as soon as it sets! If you stood over the pan and scooped it out with a spoon you wouldn’t be the first person! 😉 Speaking from experience of course (just be careful if it’s hot, it will burn your mouth)! Seriously though, you can eat it right away. No need to wait!